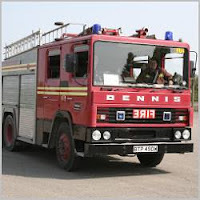 Have you ever wanted to drive a fire engine? Of course you have or maybe you already do but would like to drive a European model. I found this website the other day that offers driving experiences. Spend an hour with an experienced instructor and firefighter, learn how to manoeuvre, safely and quickly, around a specially laid out course including top gear main roads, roundabouts, T- junctions, slaloms, garages etc. To make things as realistic as possible the vehicle will be carrying a full equipment load and carrying 2 tons of water, plenty to go at with the hose! Locations: Lincolnshire (Manby, nr Louth). Price: £ 175.00. They also have a lot of other cool vehicle experiences like the double decker bus and a tank. If you are going to be in the UK, check it out.